I'm on the verandah, and there's a storm before me. Well, really, I'm on the balcony. It's not big enough to be called a verandah, and it doesn't wind around the outside of your two-storey high-set house. The base of my laptop, this damnable, unknowable Mac, is hot against my legs. I shouldn't be sitting with it like this. At least it's not plugged in. Lightning strobes in my peripheral vision. 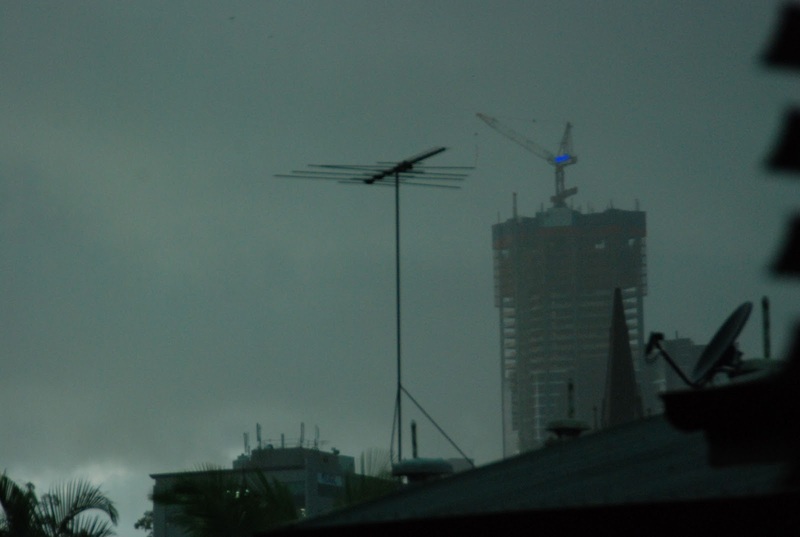 The first giant thunderclap crashes down at 4:15pm, reverberating off the tops of city skyscrapers I can just make out if I crane my neck. Speaking of cranes, a red-and-white one sits atop the tallest concrete structure; a new giant yet unfinished. A light blips on and off at the tip of the crane. I'm sitting on a lovely wicker armchair, with my feet resting on its twin. They were given to us by our neighbours, Mike and Jenny, a lovely couple who are now in pursuit of an Edwardian daybed for their verandah (their apartment is larger, with a longer balcony. I guess that's near enough to a verandah). These days of heat and steam are accompanied by a running commentary of complaints. Nobody likes heat, everybody hates heat, let's all go and eat worms. But I will not complain, for the heat ties up memories for me, sense memories burned into my epidermis. Of school, and lazy ceiling fans trying to bat off the invisible oppression; of after-school, and the soothing sweetness of frozen Cokes and SuperMarioWorld on Nintendo; of swimming until Mum yelled to get out because of lightning; of holidays and camps and misery - tinged with a sense of satisfaction that at least the eventual downpour prevented any more damnable physical activity. As it does today, ironically enough, with my personal trainer rightly staying put at home. 4:20pm. Another crackle and thump. Not as large as the first. The heat is palpable, it envelopes you in it. You are in the environment, you cannot get further in. The cold distances you, breaks you away from your environment. You could not sit on your verandah - or even your balcony - as I do now, and enjoy the smells and sounds of a hearty blizzard. 4:30pm. A magificent triple lightning strike hits just under the red-and-white crane in my periphery. One, two, three come the silver rips. 4:32pm Another, more massive tear in the sky! On the other side of the unfinished building. A diagonal strike towards it. 4:33pm. A larger strike again! White hot, raw, closer to me. A few seconds pass, I forget to count them. Thunder rolls. I will stop counting the lightning strikes now. Do you know what the best smell in the world is? Fresh ozone, post sub-tropical or tropical storm. It is the scent of both fire and water. It hits a sweet spot somewhere right between your eyes when you breathe it in. A bird calls from somewhere deep in the lushness, shaking itself off after an impromptu bath. The thunder is more distant now; the rain starting to slow. I can make out voices from nearby townhouses. Twitter tells me thousands have lost power; here in the near-city, we escape with our electricity yet again. A car alarm begins beeping in the distance. Another shallow rattle of thunder shakes itself about in the atmosphere. The storm is still going, it's just slowing for me. I breathe in again. It's worth the heat for that best smell in the world. 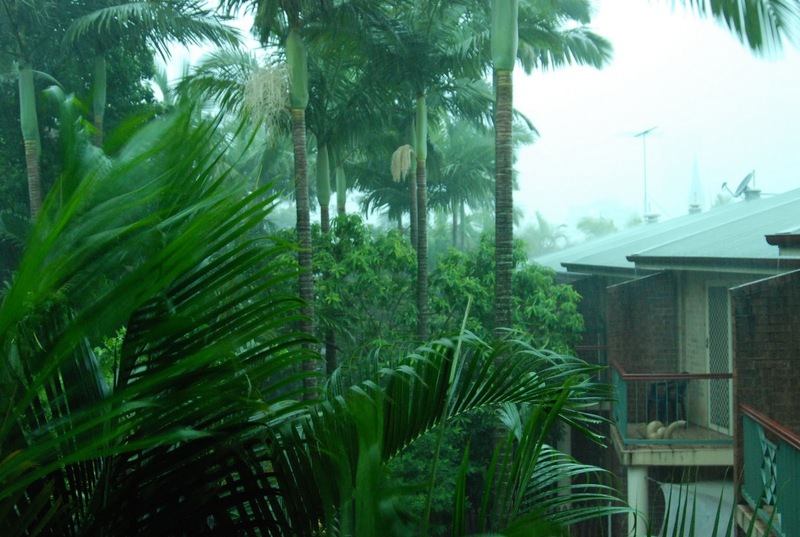 i really don't miss the breathing through wet cotton wool feeling of Brissy but you brough back losts of memories of the sudden tropical storms. They were usually on a thursday afternoon assembly day for the kids at school LOL ahh the sweet relief of the oppressive humidity and airpressure build up . Great post! I forgot how much I miss thunder and lightning and how it smells after a heavy rain. I live in England where it rains (a lot) but it's constant and consistent...and thus I have lost the smell memory of how a dry and dusty day becomes lush and renewed. There really is nothing like the delicate tap dancing sound and the gust of cool air after a day trying to remember how awful it Is to feel too cold. I remember just coming off my bus at Enoggera train station and walking over to the platform listening to a soundtrack from a favourite musical and sitting on one of the empty steel seats and watching as he sky hinted a sound of thunder. Eventually, the boy's school arrived and I stood guard over my bags as green illuminated the sky on the horizon; day was becoming swallowed by an army of cloud. 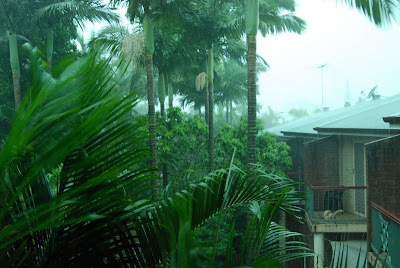 Rain began to patter the tin roof and it gradually became louder. The wind shot through, send the rain under cover and the wind swirling around my legs. I was forced to hold down my skirt as I eventually boarded the train, water cascading down its sides, and walking home at the next stop. As soon I got inside my home after stomping through many flooding puddles of water in my way, I changed into dry clothes, feeling as if I had just jumped out of the pool, and laying my soaked school books and violin case out to dry under the fan on several towels. That was a wonderfully evocative post, takes me back to the summer storms of my youth when I lived in Brisbane. Also Steamy Stormy sounds like a Stan Lee supervillian.